Q A picture poser from Peter Russell: Can you identify the occasion and therefore the score of the match from which this photo comes? From what I understand Lindsay was a player with Clyde in the 40's/50's and could be one of the players in the photo. Is it the Glasgow Cup '51/'52 against Celtic? If so what was the score, who are the players in the photo and what was the final score. The 1951-52 Glasgow Cup Final? A I consulted my colleague Forrest Robertson on this one and we are fairly sure it's the Glasgow Cup Final of 1951-52 at Hampden. The match was played on September 24th 1951 and Clyde won 2-1. Jack Lindsay was a regular for Clyde that season. 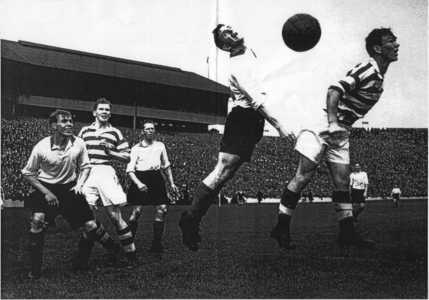 The only other meeting between the sides at Hampden during this period was a Scottish Cup semi-final in 1956 but Jack Lindsay had left Clyde by then. See the answer to a previous query about this player here. Identifying the players is harder. I reckon the Celtic player on the left could be Bobby Evans and Forrest thinks the Celtic player on the right might be the recently deceased Bertie Peacock. As for the Clyde players, we do not have a scooby and would welcome any information visitors to the site may have. A Rangers signed Jim Baxter for a Scottish record fee of £17,500 on June 21st 1960. Raith Rovers met Aston Villa at Stark's Park on September 27th that year and beat them 2-1.